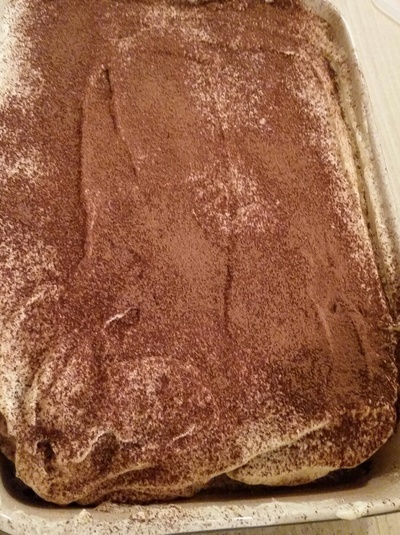 A gorgeous tiramisu very similar to the traditional version but with the addition of whipped cream to give it that extra wow factor. Bursting with coffee flavour and creamy goodness, this received rave reviews from everybody who tasted it! 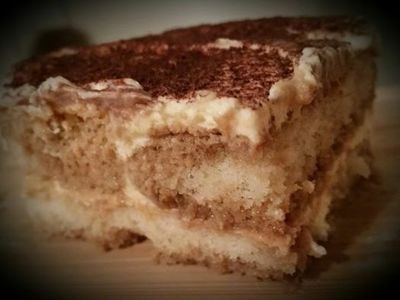 It is best if you can leave the tiramisu in the fridge for 24 hours to really soak up the flavour but overnight is good enough if you can't wait! Enjoy! Cooking Time: refrigerate over night or 24 hours if you can. Firstly, get your coffee ready and set aside in a bowl to cool. Once cooled, add the marsala. Put the egg yolks and sugar in a large bowl and beat until mixture becomes thick and creamy looking. Add marscapone and beat until combined. Beat the egg whites in a clean stainless steel bowl until soft peaks form. Make sure no water touches your eggs whites and rinse and dry your beaters. Start the formation process. 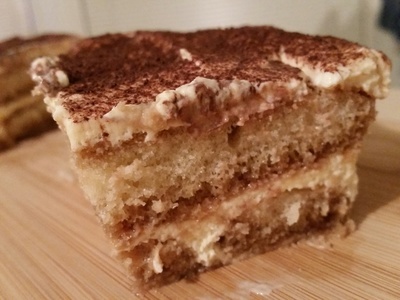 You can use a square or rectangle dish or if you prefer individual servings you can present the tiramisu in glasses. Dip the ladyfingers in to the coffee mixture and drain well. Layer on the bottom of the dish or for individual glasses, break the biscuits up first before dipping. Pour over half of the marscapone mixture and smooth out. Repeat process ending with a creamy layer. Dust cocoa powder over the top. Gladwrap and put in the fridge overnight or for 24 hours if you can last long!